Protestors say that the project will not only increase traffic congestion in the city but will also reduce the diminishing lung spaces in Bengaluru. "Tender Raddu Maadi" (‘Cancel the tender’) was the chorus emanating from Bengaluru's Maurya Circle on Saturday as hundreds of residents of the city gathered to protest the Karnataka government's plan to build a network of elevated corridors in the city. Protestors including students, residents and activists from more than 50 organisations converged at the Gandhi Statue in Maurya Circle demanding that the government cancel the tender for the Rs 27,000 crore project. The protestors contend that the project will only add to city’s traffic congestion and will only increase the number of vehicles on the roads. They also say that it will damage the environment and reduce the diminishing breathability of the city. "Research shows that if you increase road space, it will lead to more vehicles on the road. The number of buses in the city has not grown in the last 5 years, but we have 1,500 new vehicles added in the city every day. Instead of increasing the bus fleet and making more space for buses on the road, the government wants to spend money to make more elevated roads for the cars. This is anti-people and this is not development. 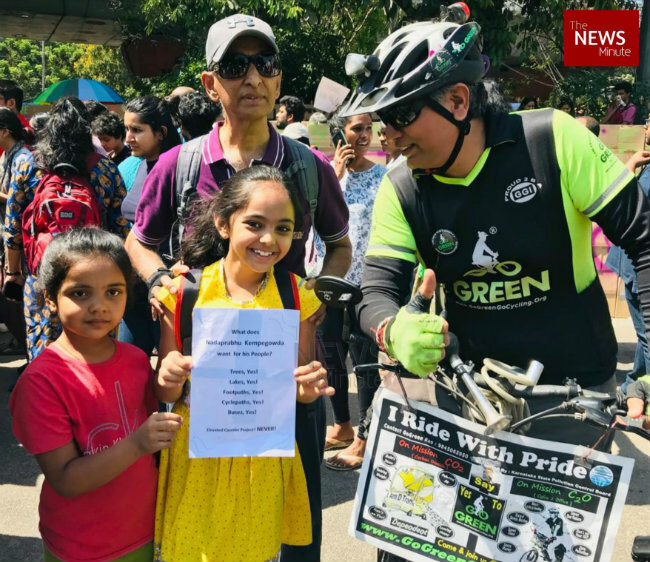 Development is ensuring everyone, whether they have a car, a cycle or just their legs should be able to commute without fear," explains Srinivas Alavilli, from Citizens for Bengaluru, one of the organisers of the protest. A study conducted by the Indian Institute of Science (IISc) has also found that the construction of the elevated corridor will lead to more traffic congestion and pollution in the future. Activists also want the government to focus on public transport services like the suburban railway system and the recently launched bicycle sharing system. 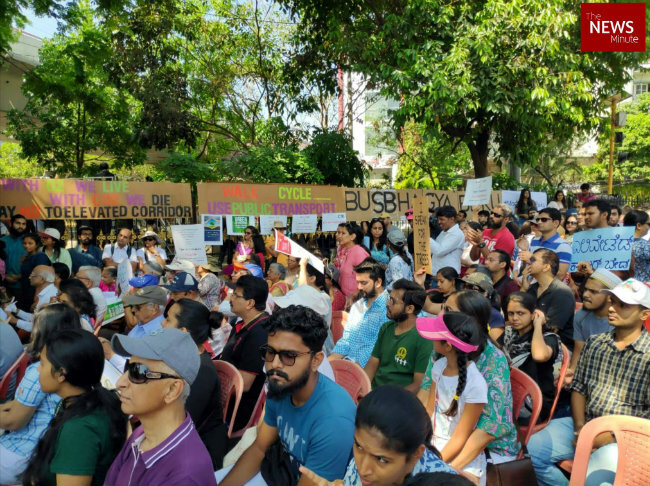 Saturday's protest was called after an Environmental Impact Assessment report on the project concluded that more than 3,700 trees will be translocated from the city, including 120 in Cubbon Park. An online petition opposing the project received more than 2 lakh signatures after it spread rapidly last week. "The trees are being translocated from the busy traffic areas to elsewhere which means that the environment at the heart of the city will be affected. This includes the trees in the Cubbon Park area from Minsk Square to Chinnaswamy stadium. The project will also not solve the existing traffic woes at areas like Silk Board junction," adds TS Subbaiah from Citizens for Sustainability. The state government is keen to continue with the construction of the network of elevated corridors in the city. There is also a section of residents in the city who are in favour of the project. The residents met Deputy Chief Minister G Parameshwara expressing their support for the project. Opposers of the elevated corridor project however say that the lack of due process followed so far. The project did not figure in the Bengaluru Development Authority's (BDA) Master Plan for 2031. The State Environmental Impact Assessment Authority granted conditional clearance for the project on March 2 and two days later, the Karnataka Road Development Corporation (KRDCL), which is tasked with constructing the elevated corridors, issued a tender for the first phase of the project for a 22-km stretch. Residents and activists are demanding that public consultations be held before accelerating the process. The construction of the project is also likely to add to the air pollution levels in the city. A small victory for protesters came when the Karnataka High Court has asked the state government to not go ahead with the project until it decides on a case regarding the functioning of Bangalore Metropolitan Committee. The next hearing in the case is set to be held on March 19. However, the court's directive is unlikely to be enough to shelve the project. The protesting residents are hoping to send a message to the state government in a similar fashion to the infamous steel bridge protest back in October 2016. At the time, a massive human chain was organised to protest against the proposed steel bridge in Bengaluru connecting Chalukya Circle to Esteem Mall in Hebbal. Five months later, the Siddaramaiah-led Congress government shelved the project. Siddaramaiah's successor HD Kumaraswamy has now promised to discuss the elevated corridor project with an open mind with the protesting residents. While BJP leaders and independent candidate Prakash Raj expressed interest in taking part in the protest, organisers clarified that they were opposed to the idea.